A versatile zoom length in a light and compact DSLR style body. 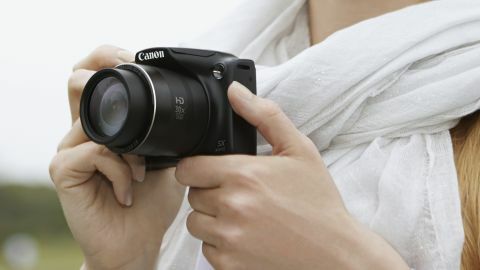 Canon's replacement for the SX170 ditches the superzoom compact styling and goes for an out-and-out DSLR look. Canon feels that the superzoom bridge camera is a really interesting area of the market at the moment, and that customers are looking for those really high zooms. It's certainly true that the bridge camera area seems to bucking the general downward trend of the compact camera market at the moment, probably because of the flexibility the zooms offer compared to a smartphone. While the SX170 was a flatter, compact style camera, it also only offered an 18x optical zoom, compared to the now 30x optical zoom offered by the SX400IS. Like several other Canon compacts, the SX400IS is also equipped with ZoomPlus technology, boosting that up to 60x. With its 24mm wide angle zoom, the optical reach goes up to 720mm, or 1440mm if you include the digital zoom. ZoomPlus works by rebuilding the pixel count to offer the same resolution as images taken using the optical zoom. This camera is aimed at the beginner audience, and as such it doesn't have manual control or the ability to shoot in raw format. It also doesn't have a couple of the more advanced features that you might find in other Canon compacts, such as Hybrid Auto or Creative Shot. There is Program Mode, however, which gives you the ability to change certain parameters such as white balance and sensitivity. Like the Canon SX520HS announced at the same time as SX400, the camera has a Digic 4+ processor. This, according to Canon, is 60% quicker when shooting at high ISOs, and 30% quicker at focusing and processing than the standard Digic 4 processor. Video recording is available, but it's only 720p, rather than full HD. Although the SX400IS has DSLR like styling, its small size makes it very apparent that it definitely isn't one. Nevertheless, it has a reasonably sized grip that gives you good purchase, and makes it feel comfortable in the hand when shooting one handed. On top of the camera, around the shutter release, is a zoom switch for extending and retracting the focal length. It's quite a fluid motion, which is particularly important when working with a large zoom. There's a short pause before the zoom strays into ZoomPlus, good if you want to stick within the optical zoom. Meanwhile, on the back of the camera there are only a few buttons, which, if you've used a Canon compact before should make you feel at home. There's a standard four way navigational pad, on which each directional key has a set function. Up accesses exposure compensation, down self-timer mode, left focusing mode and right flash mode. There's also a button for quickly switching back to automatic mode - useful if you've changed a few settings and want to quickly return to full automatic. Just above this button is a dedicated video record button, which is good when you want to quickly shoot a movie. Other than that, there's not a huge number of buttons. A quick menu can be accessed by pressing the button in the centre of the navigation pad. This will give you access to settings such as sensitivity and white balance, if you're shooting in Program mode, or settings such as image size if you're using full auto. It's also here in this quick menu that you'll be able to find the MyColors setting (for shooting with different colour styles, such as vivid or monochrome) and the digital filters, such as Fish-Eye and Toy Camera. To activate the inbuilt flash, you'll need to lift it up yourself. The camera will switch to automatic flash when you do this - but you can change the flash setting by pressing the right directional key - here you'll find a few different options including slow synchro.